Lathe machines are tools that rotate metal or wood pieces underneath specially shaped bits.They can make the operations of tapering wood, cutting outlines and removing interior pieces much quicker and simpler than the work could ever be done by hand. Using a combination of rotation speeds, bit depths and feeding pressure, you can create more and more intricate cuts in your wood projects as you experiment with and then become more accustomed to the machine. process used in machine shops and wood shops around the world. simple, single-tool operations to those that require 12 or more tool changes. 1.Squirt a drop of oil on all of the visible spinning parts of the lathe and let it slide down on its own before beginning your work. 2.Place a compass in the center of the wood and draw a circle that measures eight inches around to use for this practice session. chuck collar until the bit is tightly positioned against the wood. 4.Put on the safety glasses and work gloves before continuing. 5.Get a good grip on the side of the wood block furthest from the bit before turning on the lathe’s power. Lathe machines have allowed the accurate cutting of cylindrical parts with ease in both the metalworking and woodworking industries. 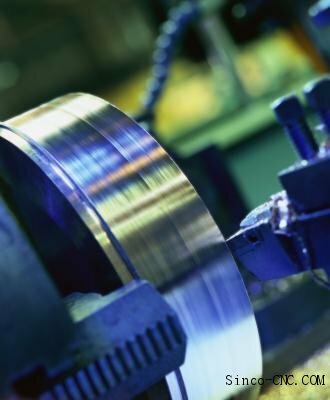 With the ability to cut raw material as it is spinning, these industries save time in the parts making process over previously used methods. A lathe machine and a skilled operator can save time on the creation of cylindrical parts and improve overall quality control. Whether you use manual or CNC lathes, the accuracy of dimensions will be much improved over those of handmade parts.